Richard Walker's Blog: So who made God? This Friday, at the School Christian Union, we had our first attempt at answering punters' questions (see this for context). 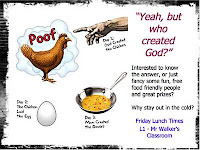 Cheesy posters, like this one (not my forte) were put up on noticeboards, announcements were made in assemblies and vox pops on this week's question, amongst others, were gathered on video by Chrissy, the local Schools' Christian worker. Normally we have half a dozen come of a Friday lunch time. This week we had 50. Boys were perched everywhere, on chairs, on tables, even sitting on the floor. We played games, watched videos, gave out prizes and I attempted to answer the question Who made God? 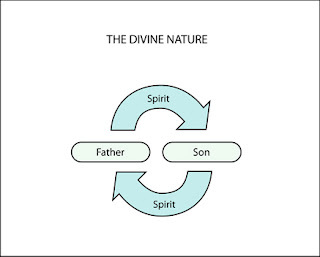 Of course, most were there lured by the prospect of free food, but the truth of the divine nature - God's trinitarian eternality (Don't worry, I didn't use those terms with the boys!) was declared and seeds were sown. What will come of those seeds, time will tell. I'm praying for the Spirit of God to do something amazing with them though and to give us a foretaste quickly. If you can spare it some air time in your prayer life, please pray for the continued attendance of these boys; that there will be an awakening in their hearts to Jesus' call, and that many boys (and adults) will give their lives to him.